Set out early. Captain Lewis and 5 men went on shore with the chiefs, who appeared disposed to make up and be friendly. After Captain Lewis had been on shore about 3 hours, I became uneasy for fear of deception, and sent a sergeant to see him and know his treatment, which he reported was friendly, and they were preparing for a dance this evening. They made frequent solicitations for us to remain one night only and let them show their good disposition toward us. We determined to remain. After the return of Captain Lewis, I went on shore. On landing, I was received on an elegant painted buffalo robe, and taken to the village by 6 men, and was not permitted to touch the ground until I was put down in the grand council house, on a white dressed robe. I saw several Maha prisoners, and spoke to the chiefs, telling them that it was necessary to give those prisoners up and become good friends with the Mahas if they wished to follow the advice of their Great Father. I was in several lodges, neatly formed, as before mentioned as to the Bois Brulé‐Yankton tribe. After three more days of talks and ceremonies with the Teton Sioux, the Corps of Discovery proceeded upstream.
. . . Above the head of the island about two miles, we passed the River Chien, or Dog River (The Cheyenne River) . . . So called from the Cheyenne Indians who live on the head of it. A part of the nation of Dog Indians live some distance up this river, the precise distance I can’t learn. . . Continued on, with the wind immediately ahead, and came to on a large sand bar in the middle of the river. We saw a man opposite to our camp on the L.S. which we discovered to be a Frenchman. A little off from shore, among the willows, we observed a house. We called to them to come over. A boy came in a canoe and informed that two Frenchmen were at the house with goods to trade with the Sioux, which he expected down from the Arikaras 6 every day. Several large parties of Sioux set out from the “Rees” [Arikaras] for this place to trade with those men. It was at this point the expedition learned of the mysterious mountains to the west — The Black Hills. This Mr. Jean Vallé informs us that he wintered last winter 300 leagues up the Cheyenne River under the Black Mountains (The Black Hills). He informs us that this river is very rapid and difficult even for pirogues to ascend, and when rising the swells are very high. One hundred leagues up, it forks; one fork comes from the S., the other, at 40 leagues above the forks, enters the Black Mountains . . . The Black Mountains, he says, are very high, and some parts of them have snow on them in the summer. Great quantities of pine grow on the mountains. A great noise is heard frequently on those mountains. No beaver on Dog River. On the mountains great numbers of goats, and a kind of animal with large circular horns; this animal is nearly the size of a small elk. White [Grizzly] bears are also plenty. The Cheyenne Indians are about 300 lodges. They inhabit this river principally, and steal horses from the Spanish settlements to the S.W. This excursion they make in one month . . .
From here the expedition continued north for several more weeks, and then made a winter camp near current-day Bismarck, North Dakota, continuing on to the Pacific Coast in 1805, and returning down the Missouri River to St. Louis in 1806; a remarkable journey through the center of the continent, establishing the former French possession as a part of the American West. Settlers, gold seekers, businessmen, and the railroads followed on the news of this vast and rich territory, forever altering the face of the land during the following decades. 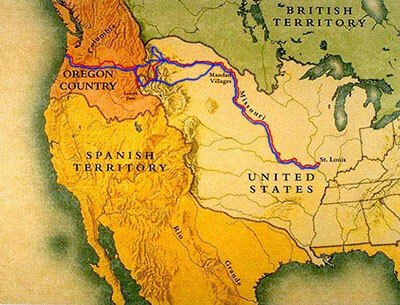 The Lewis and Clark Expedition was also the first white diplomatic and cultural contact for many of the tribes, and only the beginning of a long history of two-way cultural misunderstanding and misinformation. The upcoming Lewis and Clark events provide a perfect opportunity to promote a better understanding between the cultures. With three years of bicentennial events coming up, countless tourist programs and reenactments will be taking place all along the Lewis and Clark Trail, and Indian tribes know that tourists will be visiting their communities along the way as well. Though many Native Americans do not agree that Lewis and Clark were American heroes, they will be presenting tours, exhibits, and stories that tell the expedition story from their viewpoint. Your visit to the Black Hills offers you a unique opportunity to learn about the huge impact white culture has had on this land and its indigenous peoples. Many fine museums in the area focus on the region’s frontier past and the tribes of the Great Sioux Nation. You will begin to understand the values and beliefs of Native Americans and how they complement your own—attend a powwow for traditional song and dance, view the authentic artwork that is the Sioux heritage, and appreciate the buffalo and other wildlife they depended upon for their livelihood. You will also experience the awe and wonder of the region’s landscapes as Lewis and Clark’s party did nearly two hundred years ago. Make the commemoration of the Lewis and Clark journey your own Expedition of Discovery into the Black Hills and Northern Plains region.